For each customer ordering a product by courier ,the most important thing is time. Thanks to our warehouses within 300m² area our we are able to reduce elapsed time for upcomming orders. Fast and safe delivery thanks to independence. Each shipment is protected within OC insurance policy , and any confidential information will be kept internal. 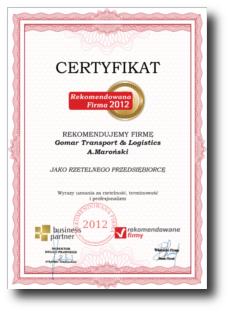 We guarantee an efficient service in relation to the duty classification of the freight and any consequent duty clearance required..
We check every transport paper, is needed. OUR TRANSPORT IS THE FASTEST & THE MOST RELIABLE ! It is our skilled, competent and highly motivated employee base that forges winning entrepreneurial characteristics and takes a personal stand behind the optimisation of all your corporate logistics requirements. 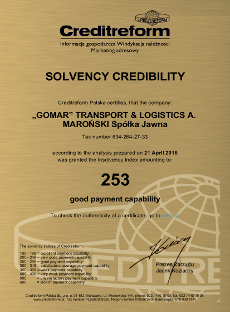 The Gomar company is therefore the most competent service provider for materials and products, communication and information flows along complete, value-added chain processes within the overall trade and industrial market sectors.